We had a wonderful stay here. Jean and Sue were so easy to work with. The condo was beautifully decorated and recently updated. It was cleaned and ready for us when we arrived. It provided all we needed for a wonderful, relaxing stay. Both Jean, the owner, and Matt, the property manager, were accessible if needed. This was our 4th stay at the Prince Kuhio complex. We love its location - great beaches, restaurants and shopping are only about 5 minutes away. There is even a small beach and great restaurant directly across the street! You can’t beat the sunset views from here! We look forward to returning here soon. We were very pleased with our stay. The condo definitely met our expectations, was well-maintained, well-equipped and comfortable. The location was excellent with a nice view from the lanai. Also there are plenty of nearby options for lunch, dinner or drinks. The communication with the owner went very smoothly. Karen Alaska Awesome stay We definitely enjoyed our stay in this unit. The owners were very responsive to any questions or concerns. The kitchen was beautiful and fully stocked with any kind of kitchen utensil you would need. The walk-in shower was awesome. We enjoyed the patio and the pool. While not truly ocean front property, the proximity to the water was nice -- also close to walking paths, botanical gardens, shopping, restaurants. We would definitely stay there again. PK105 -- One of the BEST places to stay! I have been to Kauai over a dozen times, and I have rented a different condo each year. Jean and Sue's awesome condo is one of my favorite places. Jean and Sue are very responsive to questions about the condo and the island. The kitchen is fabulous and outfitted with everything you might possibly want to use to cook. We enjoyed it so much we rarely ate out. Jean and Sue are very generous with cooking supplies. The updated bathroom is also a joy to use. Whether you need Beach towels, beach chairs, or a cooler -- it's all there. The decor of the condo is charming but comfortable. There is generally a cooling cross breeze. The laundry facilities are just a few steps away from the condo. And the location of the condo is so convenient to the southside of Kauai without all the congestion and traffic in "resort row" in east Poipu. There are breathtaking sunrises and sunsets a few minutes walk or drive away, e. g., the ocean across the street, Lawai Beach by the Beach House Restaurant, a public pier and Spouting Horn to the west, "the Wall" and the Sheraton to the east on Poipu Beach Road. For those with kids, Baby Beach is a 5-10 minute walk. The pool at Prince Kuhio is updated and great. A 5 minute drive away are The Shops at Kukui'ula, which offers local boutiques, art galleries, weekly culinary market (highly recommended), and renowned restaurants. Jean and Sue's home became our home, and we loved our stay. This condo and the owners are delightful! I give PK105 my highest recommendation!! I'll be back. We had the pleasure of staying in Jean and Sue's Prince Kuhio condo last month. The location was perfect as the ocean and snorkeling was across the street. There's a wonderful path along the road/ocean that is great for a walk or run. It's within walking distance of a beautiful shopping area that includes wonderful shops and restaurants. The unit backs the Prince Kuhio Park and you can see the ocean from the lanai. It was a prefect stay for us and we hope to return to the same unit in the future. We stayed at the unit for 9 days and absolutely loved it! 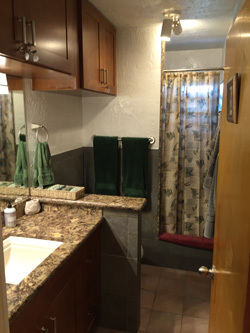 Unit has newly remodeled kitchen and bathroom. It was the perfect size for the 2 of us. Looking out the lanai is a great view of park and ocean across the street. Because of the humidity it does get warm, but they have numerous oscillating fans and I kept one pointed in my direction through the night. I found myself under the covers frequently. I defy you to find a nicer unit for the cost. We dined at The Beach House across the street and spent quite a bit of time in the Kukui'ula Village. Lots of good restaurants in there and Uncles Shave Ice is the bomb! We would absolutely recommend this unit to our friends and family. ALOHA!! Thank you so much. No words can describe the experience we had here. We had everything we needed and more Would love to come back. We had a wonderful time on this beautiful island. We felt right at home in your condo and had everything we needed. We will be back! We enjoyed staying in your condo - we wish we had one just like it in this same area. Thank you also for the "little personal touches" you provide your guests - it shows you have warmth & class. Thank you for allowing us a late check out time. Kauai is such as Paradise!! This was our first trip to Hawaii - and we decided to stay on Kauai - so glad we did! We enjoyed our stay very much - and loved your Condo. We would have liked to have had more info available about nearby grocery stores but.. we were able to find them on our own What a great stay! We loved our stay in your beautiful Condo You maintain a well stocked Kitchen for guest that want to eat in. The Blue Dolphin dinner Cruise was the best and the Smith family Lu'au was a great experience. We also enjoyed shopping on this wonderful island. We loved so many things about your condo: The great CD collection for the guest of Hawaiian Music & The Library of Kauai & Hawaiian books - fiction & non fiction, Comfortable bed and linens & Well stocked Kitchen. We enjoyed great snorkeling & sunsets at the Lawai Beach (Beach House Rest) just steps away from your front door. 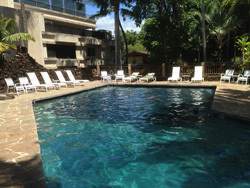 The Prince Kuhio Facility has a sparkling large pool & plush tropical gardens. Again - your Condo is in a perfect location - with adorable accommodations. We have stayed here now for the second time - the first in January 2013 ( with our son ) and now this time ( just the 2 of us ). We have enjoyed both trips very much and will come back. We love the view from your large Lanai of Prince Kuhio park and Beach. The snorkeling was great - saw lots of fish. We love Kauai - because it is still not crowded like some of the other islands in Hawaii. Great time in Kauai - staying at your Condo during Christmas & New Years We enjoyed a great Christmas dinner at the Beach House Restaurant. We also enjoyed the beautiful sunsets on their lawn area. We also enjoyed eating out on your Lanai - enjoying the view from there Thank you again - we will be back !!!! 3 glorious weeks in a garden paradise !! This is such a cute Condo!! We had a totally comfortable time staying in your condo. We loved the snorkeling @ Lawai Beach. We come to Kauai every couple of years - so we will be back to book with you again. One highlight was the horseback riding nearby - they took us to such scenic places - what a great time it was! What a delightful Condo to call home!! Looking foward to a return visit !! We had a great time in your well equipped & well maintained Condo. We enjoyed snorkeling at Poipu Beach & saw more fish than we expected! Watching sunsets across the street from your condo every night was a highlight. All things considered your condo is one of the best in our opinion. We would love to stay here again. We had a fabulous time in Kauai and staying in your very nice condo added to our enjoyment. The condo was beautiful and had everything that we needed. We loved having our meals out on the patio looking at the gorgeous view of the ocean. We hope to return to your place for another vacation in beautiful Kauai! We rented condo #105 (first floor) and are staying here a week. We wanted the first floor because we're divers and we wanted quick access to the car. This has been a great little condo, with everything you need in the kitchen, beach towels in the linen closet, even DVDs (for both adults and kids) to watch on TV. There's also a great selection of Maui guidebooks (hiking trails, sea life, etc.) that I used for planning day trips. There are laundry facilities that take credit cards (you just have to pay for detergent with quarters). There are also two BBQs onsite near the pool. We spend most of our time (when we're not out) in the living room with the curtains wide open. We can look at the park next door, watch the chickens meander about (they are everywhere on Kauai), and see the snorkeling bay across the street. The dive shop (Seasport Divers) is five minutes away, which is super convenient, and the overpriced restaurant, Beach House Restaurant, is close too. Great place for drinks and appetizers. But that's why the kitchen at the condo comes in handy. You can save money making most of your meals here. There's a "Whole Foods-type" market up the street, and a regular market a couple of miles away where you can get everything you need. Check-in was super easy. the keys were left at the car rental counter. Overall, we are very pleased with this rental. A lot of our friends had recommended Kauai to us - so that's why we came. Everything was so enjoyable for our stay - the Drives/ Beaches / hikes and daily morning walks / sightseeing / snorkeling / eating out, etc... We also enjoyed meeting such nice people. The people who live on this Island are so friendly and relaxed. What appealed to us was your unit felt like home. It was perfect for our 3 person family. 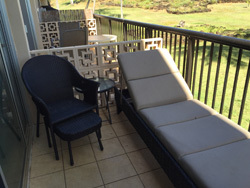 We loved that the Large Lanai had a chaise lounge, side table, small dining table and 2 chairs - perfect for a relaxing breakfast or early dinner. all in all we had a great time. We can't wait to come back. What brought us to Kauai was that we wanted to explore an island that we hadn't been to before. We had the chance to both hike and snorkel. Everyone we met was friendly (The Aloha Spirit ). The Condo was small, but very comfortable. We enjoyed sitting in the living room listening to the Ocean and the birds. What we enjoyed about this Vacation rental condo was that everything was taken care of for us. The condo had all the modern conveniences We would rate this experience a 5 star ( out of 5 ). Kauai is such a beautiful Island. We have stayed at the Pince JKuhio resort on 3 different times in the last 3 years. This year for the first time - we Zip lined & took a helicopter tour- what fun!! We also snorkeled, hiked and kayaked. There is so much outdoor activities to take advantage of on Kuai. we visited several botanical gardens & ate meals at various great restraurants nearby. Your condo is very nice - especially the living room with that great view of prince kuhio park & the beach. You have a great audio visual system - we loved your collection of Hawaiian Music for us to listen to. Your library and book collection ios both interesting & informative. Your place is a delight to stay in! It was just like our own home, nice and cozy & right by the beach. There was everything we needed to make our stay easier. What a great place to cook - with all the cookware and utensils provided. Kauai vacation rentals ( the on Island management company ) - met all of our needs. We enjoyed the Kilohana Luau, the turtles at Brenneckes Beach & the Lamperts ice Cream. Jean and Sue offer a completely outfitted vacation rental condo for both relaxers and go-getters alike. We traveled to Kauai as a couple, with our toddler in tow, for some fishing, hiking, snorkeling, and of course, dinner at the renowned Beach House Restaurant. We could not be more happy with our stay. 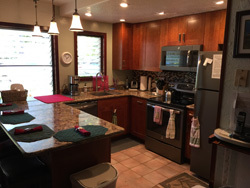 Jean & Sue's condo offers a fully equipped kitchen for the culinary-minded vacationer, as well as a comfortable living room for entertaining (we traveled with other family to the island). We especially appreciated the lanai and the friendly neighborhood. If you're looking for home away from home, this condo has it all. We were delighted to be greeted by sea turtles almost every time we walked along the water line, and enjoyed the convenience of local shopping. A quick swing up to Koloa will provide any grocery shopping, shaved ice, or macadamia nut ice cream; continue to Hanapepe for local eats at Grindz or the little sushi bar. We hope to return in the future. Thank you Jean & Sue for your hospitality. First of all it was easy to find and an excellent location for the Poipu area. The Lawai Beach across the street was very good for snorkeling or just kicking back for awhile and none of the other beaches were that far either. As for the Condo, we have done this several times and I don't think I have seen a better equipped one. Might be the cleanest one too. The bed was very comfortable and I loved the way the breeze moves through the rooms. Overall you have an A+ place there! Thanks for letting us be part of it. We loved your condo! Kauai is now our new favorite island. Your condo was perfect. It was clean and comfortable and stocked with everything we needed (and things we hadn't even thought of). We loved the ocean view from the deck. The king size bed was very comfortable and our 13 year old daughter enjoyed having the pull out bed in the sunroom. Your place was close to everything and we loved that we could walk across the street to the beach and snorkeling. Parking was never a problem and our daughter enjoyed swimming in the pool at the complex. Your condo was very convenient to get to from the airport via our rented car. We loved having the full kitchen and loaded up on breakfast and lunch items; but we ate out every evening as there were so many wonderful restaurants nearby! Thank you for sharing your home with us. We will definitely (and have already) recommended your condo to family and friends. I truly enjoyed my stay at your condo. It was clean and very comfy. I found the location to be peaceful along with plenty to do and see. Great also for long scenic walks or jogging. What a beautiful view of the sunset from the Beach House. I'm already looking forward to my return to Kauai. Your Condo was very Comfortable & Clean. Reliable comfort with all the amenities. This Condo is a great value. We had a wonderful time. We have been to Kauai several times and really love this island. Thanks for providing us with such a well stocked and homey place to crash after a full day of activities. This was our first time to this wonderful island and we plan to come back. You open your front door and know you are at home. We got in touch with our spiritual side while here taking time to become involved in learning the history of this beautiful island. The museum in Lihue is worth a see. You are truly blessed to have this condo as your second home. May your lives be richer for the time spent here. What a beautiful condo !! We loved that it was stock with spices for cooking plus the beach gear. Thanks for the books supplied - it made for a great stay. We will come back !! We enjoyed our stay in your condo. Hopefully we will have a chance to return to Kauai and stay with you again in the near future. Enjoyed having drinks on the large Lanai, snorkeling across the street, relaxing by the large pool and playing board games provided by the owner. We love the island and the people who live on it. Condo was great - perfect for us - clean, well equipped, even with beach chairs and small cooler. Perfect location on South Shore, close to Po'ipu Beach, Spouting Horn and charming town of Koloa. We spent much of our beach time on north shore at Hanalei, an hour fifteen minutes away, but were always happy to go home to quieter, more serene Lawai Beach. Be sure to make a reservation at the Beach House for dinner - right across the road. Kauai is just beautiful. We were grateful to have made the choice to spend all our time there instead of island hopping. We found this unit to be well located for just about anything you might do on Kauai. It's about 20 minutes from the airport, 20 minutes to Port Allen boat charters, 35 minutes to Waimea canyon, and about an hour to Hannelei Bay, which the locals will tell you is far, but isn't by mainland standards. The beach across the street is perfect for swimming and snorkeling if the sea isn't too rough. The Beach House lawn is great for sunsets! The unit is exactly what you see here, I was surprised at how accurate the pictures were! The building is quiet, cool and breezy in the summer. The markets in Koloa Town are close by and a big help. My wife and I spent the past Xmas holiday here to escape the North Dakota cold and the accommodations were excellent and everything we had hoped for. The owner was very quick about answering any questions that we originally had and being that this was our first trip to the Islands, we asked ALOT of questions. Access to snorkeling is excellent and I snorkeled every day across the street, mostly off the sand beach to the west. Back to the condo: This listing is very clean and you have all the necessary items that you will need. You may even find a fishing rod/reel that I left there! If you are looking for a great getaway on a great island, I strongly recommend that you check out this listing. 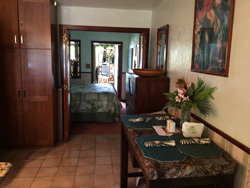 Prince Kuhio offered all the comforts of home, a full kitchen, nice living area, and wonderful bed! We loved the location, just across the street from a fun swimming/snorkling area and a delicious restaurant. We found ourselves at the Beach House Restaurant each night for either cocktails or dinner. We just wish we could have stayed a little longer! We total enjoyed our experience here at your Condo. What a great spot!! This has truly been memorable. we are practicing for our retirement. Kauai and your condo was truly beyond expectations = lucky us!!! We were surprised at the amount of personal items for our use in your condo. We had everything we needed. Your unit is well laid out. we can tell you put allot of thought into the place to make it comfortable. We had a wonderful time and wish to come back. Thanks for leaving your condo to us. The kitchen was very well equipped. Fridge and oven were great. it was a pleasure to cook. Your condo is equipped with great books - thank you Everything in your condo is very clean Kauai is such a wonderful place to stay. Rating: Excellent! My Aunt, Cousin and I enjoyed our stay at Prince Kuhio unit #105 and plan on returning. The condo was immaculate, had everything we needed and the view was beautiful. We especially enjoyed the short walk to see the sunset every night. It was peaceful, quiet, beautifully decorated and very comfortable. 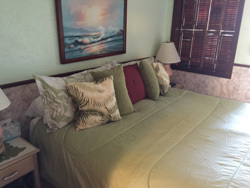 Thank you, Jean & Sue, for the use of your charming getaway in Poipu. The place was immaculate, exactly as listed and shown, except that your pictures can't actually impart just how cozy and comfy it is! And, talk about well equipped. Who does the baking? The lanai, with its great view to the sea through the trees, was a restful refuge and great place to enjoy my early morning java. And, being on Kauai, handy to everything. Eight days in paradise. My wife and I really enjoyed the condo and staying at the Poipu beach area. The Condo was well equipped and very clean. The manager Lucy checked in a couple of times to make sure we were ok. We did day trips from our condo and loved the time we spent in Kauai.